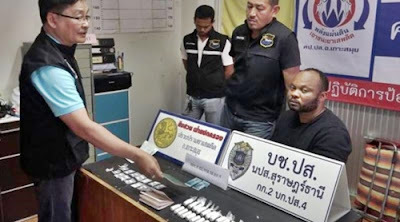 A 45-year-old Nigerian suspect, Chinedu Victor Okeke, ran Sunday, August 5 after being found by police in Samui, Thailand. According to Thai residents, the police and soldiers had to sue Chinedu, who jumped out the window of his rented house, climbed the fence and rushed to a temple where he was finally immobilized. The tourism and immigration police and some soldiers had gone to a rented house in Bophut after the district chief of Koh Samui suspected that the foreign renter was selling drugs on the tourist island. But Chinedu was not going to surrender without a pursuit. He quickly went out of the window, crossed the fence, and ran to the temple of Wat Laem Suwannaram. But the police and the soldiers in pursuit caught him there and took him home. A search revealed that the suspect had hidden 4 bags of cocaine powder, weighing 2.5 grams, behind an electrical switch. In a box containing imported alcohol were 12 bags containing 11.3 grams of cubes of cocaine and 27 tubes of the same drug weighing 271.6 grams. The suspect admitted that the cocaine was his and that he had bought it from a Nigerian friend. He said he sold the drugs to Thai and foreign tourists for 1,000 to 18,000 baht in various entertainment venues on the island.